This Indicator is an affordable trading tool because we have incorporated a number of proprietary features along with a new formula. The Advanced Accumulated Currency Volume Indicator is specialized for the main 28 Forex pairs and works on all time frames. It is a new formula that on a single chart extracts all the CURRENCY VOLUME (C-Volume) of AUD, CAD, CHF, EUR, GBP, JPY, NZD, and USD. This is a great advantage in trading. Volume traders will know how to use it. If you are new then learn how to read the extreme values and add it to your trading arsenal. Think of C-Volume as a shield, not as a gun. 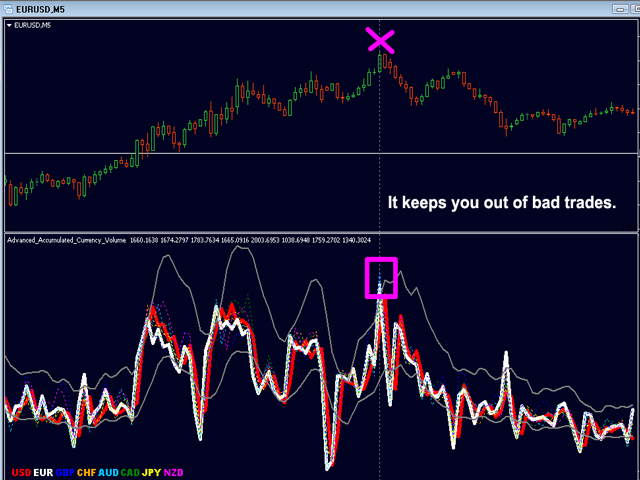 A warning sign will show on the main chart warning you to get into wrong trades. This is not the commonly used simple Volume of a pair. 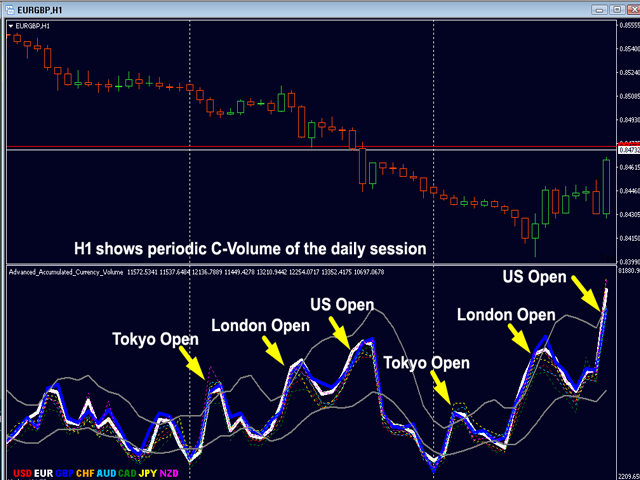 The Forex market is scanned and volume for each CURRENCY is extracted and accumulated to C-Volume. We now can see which currencies have the highest or lowest volume. We can see on a single chart what is going on within all 28 Forex pairs. If EURO has a strong spike check the EUR-pairs for possible trades. If Pound has a strong spike then check the GBP-pairs. Built on new underlying algorithms it makes it even easier to identify potential turning points. This is because it graphically shows C-Volume spikes on a currency. These features were designed to help and keep you out of bad trades and guide you to enter pullbacks. Important is C-Volume for the base and quote currency of the pair. Ignore the other 6. 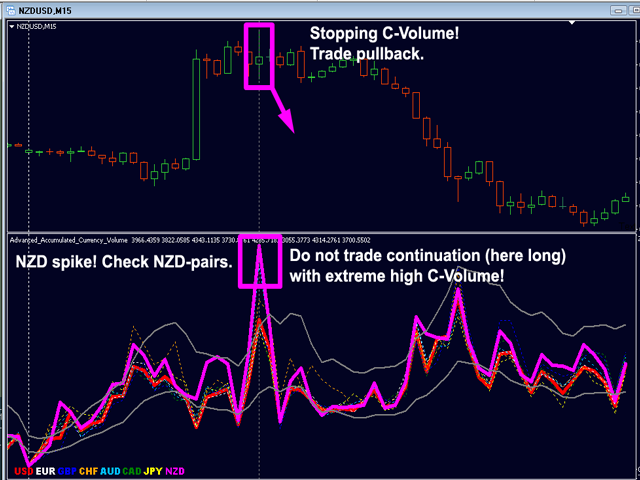 C-Volume is not a lagging indicator. It gives an instant warning signal and spikes outside the range are not to be ignored. 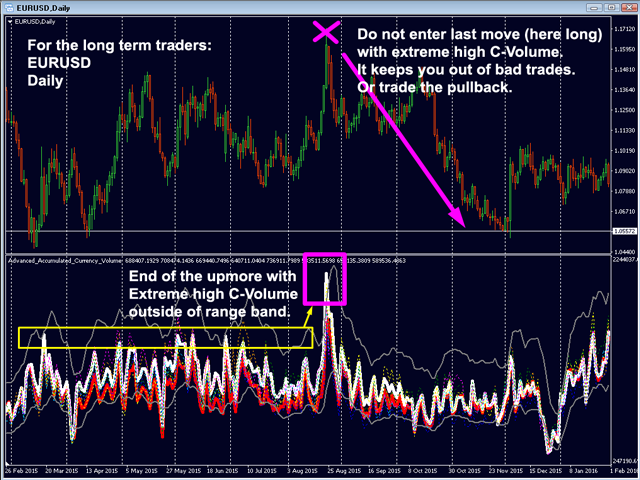 Do not trade on extreme high C-Volume outside of range band! It keeps you out of bad trades! Or trade the pullback. 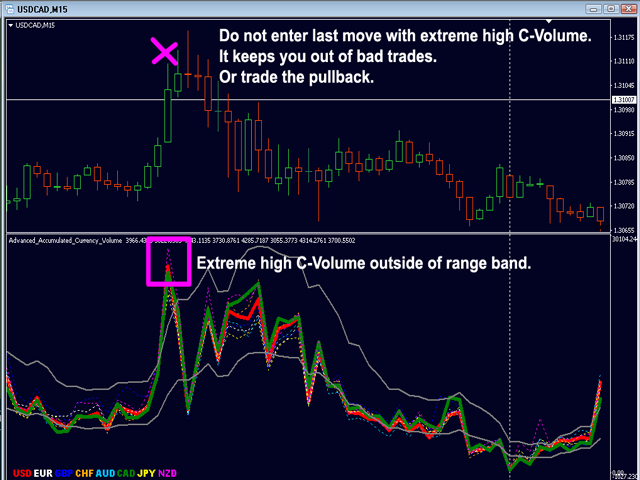 Do not trade on extreme low C-Volume outside of range band. 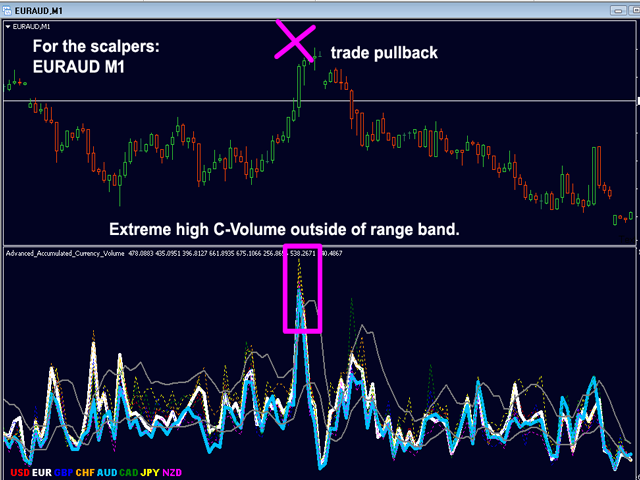 Higher probability trades: Enter on rising C-Volume within the range band. Avoid trades on falling C-Volume. In contrast to common volume, this indicator has a special formula and C-Volume can be used on a live candle. As long as the candle is open it will give an approximated value. I wish you many green pips in the future and success to your trading career. Great indicator to avoid fake breakouts! Very useful indicator that is worth buying. Purchased this indicator to combine with my ASC28, should do this early. A good addition to acs8 system. What it does is to help u stay out from fakes signal. Very useful indicator to avoid bad trades or take profit at good time. Highly recommended. funciona a la perfecion, alquile los 2 otros indicadores impulse y stregnht 28 y me enamore de la simplicidad y eficacia de estos, siempre y cuando se siga las reglas y condiciones .resumidante PERFECTO. 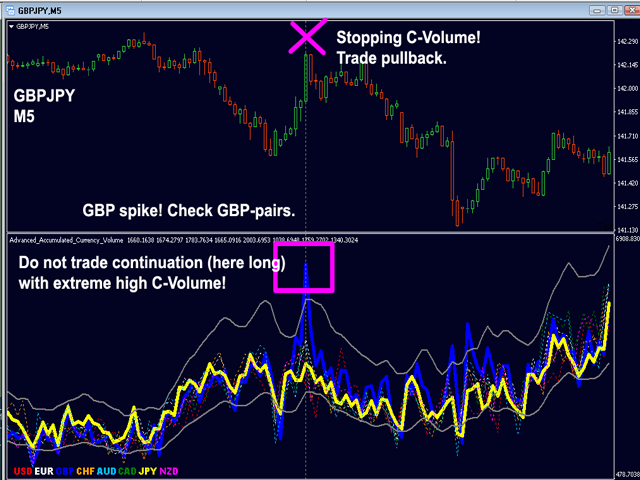 Using C-volume to spot possible trend reversals during my trading. Simple and fast indicator to proof trend or stopping volume. In combination with ACS and Impulse - C-volume completes my trading instruments. Currency Volume - the shield, the condom for his strategy. This indicator saved a lot of money for me, one year by now (yes, i will extend my subscription). It's about to find out if the direction the rate takes is "true" or if you have to stay out of the trade, how to identify if it was just a spike or maybe start of a trend. I totally agree with Julian, more or less it makes no difference trading the data of a cfd or spot forex because in the end the bulls and bears statistic is the same. 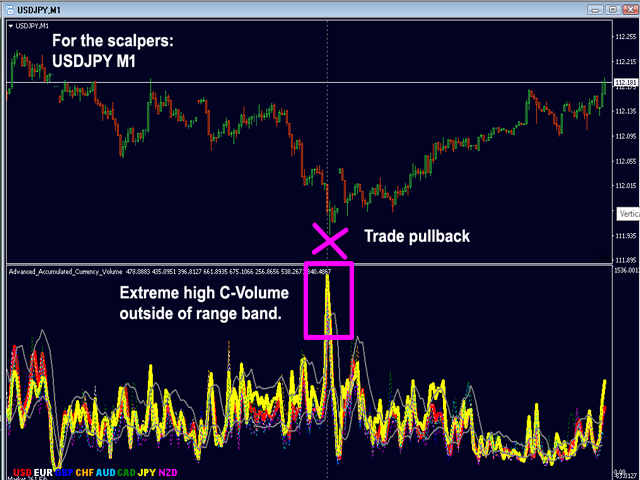 But I could imagine that at spot forex the spikes could be way more extreme due to the higher overall volume(? ), never studied this. Bernhard best support so far. "The Forex market is scanned and volume for each CURRENCY is extracted and accumulated to C-Volume." How cool is that? I have never seen anything like this. I have at least 4 other different volume related indicators. I have tried accumulation/distribution, money flow, on-balance-volume, and price-volume analysis. Nothing can match. The only sensible one may be the market profile, but none is able to monitor 28 pairs from 8 individual currencies. Often I hear people say "This is not stock market. Volume data is useless because you will never get the true volume of the entire forex market". Think about this. The volume data from your broker are from broker's liquidity providers. There may be 12 to 20 banks who handle all the transactions for your broker and for other brokers. You are trading with other traders in this pool. The group may have different total volume than that from another group in a different corner of the world. Why should I care? If there are no more buyers in my pool due to volume exhaustion, the price will drop - within this pool. So I short the currency and make money from other traders in this pool. Besides, volume in this group is not isolated in vacuum. It goes up and down with the entire market. 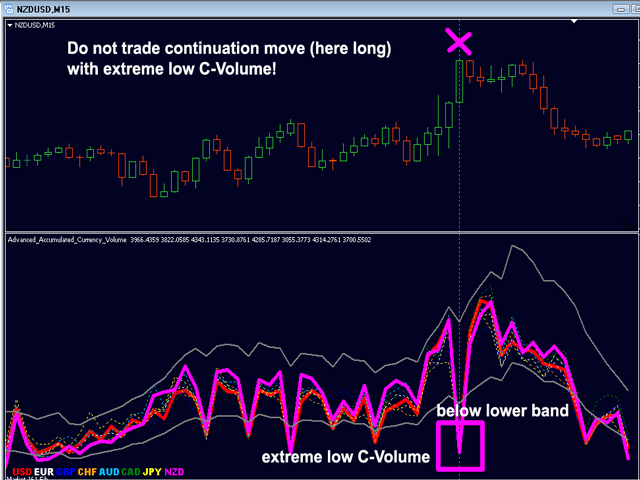 So, forex volume works just the same as stock market. If you use Impulse, this indicator will help you from getting into a trap. Highly recommended. Optimized drawing of the sign on actual chart for high currency-volume and the alert. New including ALERT for extreme C-Volume. 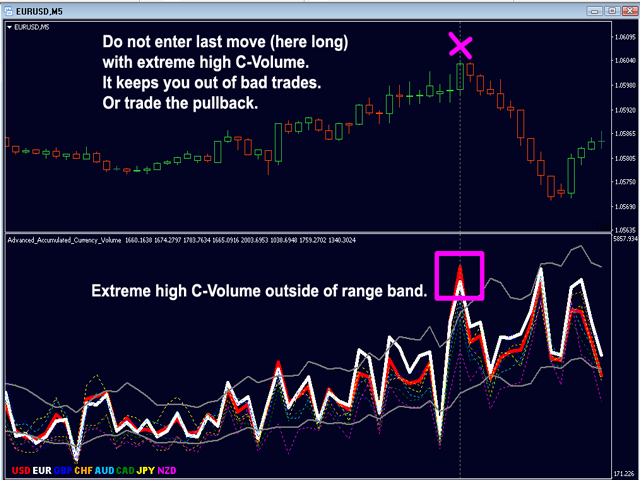 + added warning sign in the main window when C-Volume of the base or quote currency is extremely high and outside of the range band. + added warning sign in the main window when C-Volume of the base or quote currency is extremely low and outside of the range band. 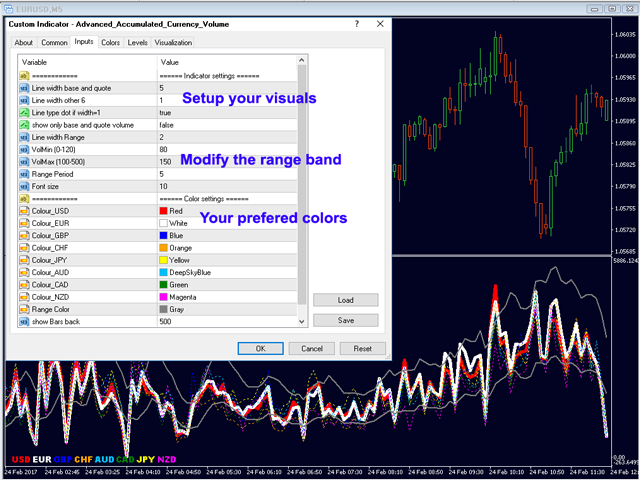 Now you have the drawings on the main chart and you can optimize the settings to your trading style and timeframe!